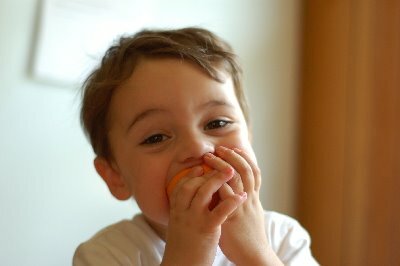 He now eats oranges--and I don't have to peel them. It took him a while to decide that he liked oranges. I think that is mostly because he always tried to eat the peel instead of the good part. Then he finally tried a wedge, and he liked it. But I would have to peel it for him. Now he has graduated to eating the inside and not nibbling on the peel. So no more peeling for me! This is SO much easier! What a cutie! My guy likes to eat oranges the same way!